Lighted pylons and cars create a light show on Century Boulevard, near the entrance to Los Angeles International Airport. The airport plans to install new technology in a bathroom at Terminal 4 to help keep them cleaner and notify passengers when a stall is vacant. LAX officials are teaming up with two technology companies — Infax and Tooshlights — to install lights and digital gadgets that keep track of how often bathrooms are cleaned and let travelers know when a stall is in use or vacant. The new “smart restroom” pilot project will be introduced April 4th on a bathroom at Terminal 4, which is occupied by American Airlines, American Eagle and Qantas. 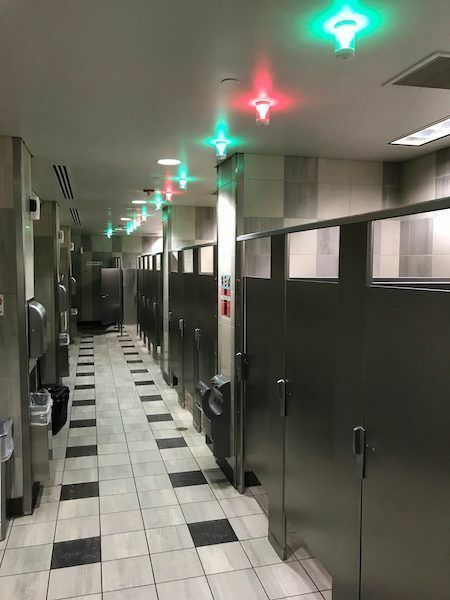 Lights that turn green when a stall is available and red when a stall is occupied are being installed above each stall. The same system tells managers when and how often bathrooms are cleaned. “We’re incredibly excited to try out this new technology, which should help improve our guest experience and allow us to better monitor and service our restrooms,” said Barbara Yamamoto, chief experience officer at Los Angeles World Airports.